Part of the beauty of a tattoo is the unique person behind the skin and ink. Cameron Walker shares about the story behind her tattoos, and why she chose these words and designs to represent parts of her life and personality. 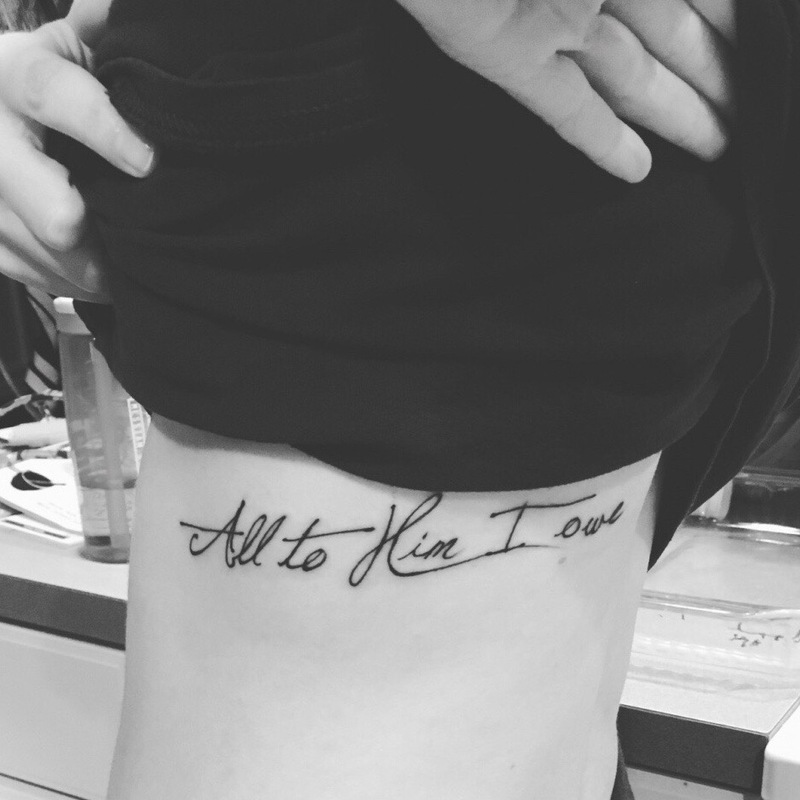 I have two tattoos, one on my ribcage that says “All to Him I owe” from the Jesus Paid it All hymn. My second are wildflowers on my right arm. What is the meaning behind your tattoo? My first tattoo symbolizes the time when my brother rededicated his life to Jesus on a missions trip to South Carolina. This was the song that we sung and it symbolizes a moment where Jesus transformed his life. My second tattoo resembles a time in my life where I was searching for my identity. I was told by some that ink on my body would change who I was as a person therefore, I disagreed, and drew a design that I could call my own – something that could permanently state that I am beautiful with or without a marking on my body whether that be a piercing, tattoo, or even a scar. I have fallen more in love with it and find that through each season of life, I can be reminded of where I was and what it took to get to where I am now. When did you first get your tattoo? I got my first tattoo when I turned 18. When was the first time you decided you wanted a tattoo? I was always interested in art and found tattoos to be a beautiful art form. I had ideas ever since I was a freshman in high school and I decided I wanted to create my own, therefore, I drew up my arm template and gave the artist the freedom to add his own personal touches. Would you get another one? Oh yes, I plan on finishing the arm piece and hopefully creating a half sleeve.